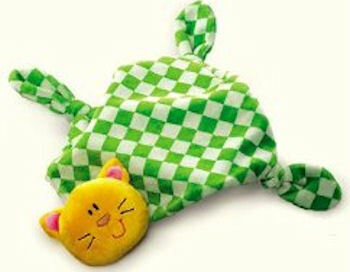 I’m looking for a Russ Berrie Comfy Kitty blanket (also called Russ Kids Bright Beginnings Kitty Blanket) with a bright yellow head on one corner of a green and white checkerboard blankie with knotted corners. My grandson is very attached to the one he has, and we can’t find a replacement. With several washings, it is wearing out, so we hope to find a new one. Amazon.com and a few other places say it is out of stock, but maybe someone out there has one. It doesn’t say anything about the availability, but it’s worth a shot. There’s an 800 number at the top of the site that you can check out. Good luck! It looks as though this company still carries this. I will contact them to make sure.THANKS SO MUCH!!! I am looking for this kitty too but the website link in the comment above no longer works. Has anyone seen them for sale anywhere else? Also looking for this blanket… I’m having no luck!! If you know of a place/website that is selling it please let me know! There is a gorgeous store in Sydney 2018 that stocks amazing giftware, home decor and Beanie Kids. They stock this blankie in different styles including this Cat design. Thanks. I checked too. The cost is $12.95 and the shipping to Canada is $10.00. Really appreciate your help. Thanks for this information. I will check them out too! my son loves this kitty. he has had it since he was 6 months old. really hoping there is one out there. please please help. I have recently had to find the giraffe for this group and have run across the kitty and the others on my search. If you are still in need I may be able to help.